Seven interesting things about Keshvananda Bharati case – The legend lives on! Ever since Independence, Judiciary and Parliament have had conflicts over guardianship of the Constitution. Kesavananda Bharati was the culmination of this conflict. In 1967, the Supreme Court, in Golak Nath held that Parliament could not amend or alter any fundamental right. Two years later, Indira Gandhi nationalised 14 major banks which was struck down by the Supreme Court, although it upheld the right of Parliament to nationalise banks and other industries. A year later, in 1970, Indira Gandhi abolished the Privy Purses which was also struck down by the Supreme Court. Indira Gandhi was by now determined to curb powers of the Supreme Court and the High Courts and she introduced a series of constitutional amendments that nullified the Golak Nath, Bank Nationalisation and Privy Purses judgments. She later on attempted an ill advised move to cultivate a committed judiciary and grabbing away powers of Constitutional Courts via tribunalization etc through the 42nd Amendment. In a nutshell, these amendments made then gave Parliament uncontrolled power to alter/abolish any fundamental right. The core question in this case, popularly known as the Fundamental Rights Case, was: did Parliament have unlimited power to amend the Constitution or was there any implied or inherent limitation on such amending power? It was answered via the basic structure doctrine (BSD). The entire case came very close of being reheard because of illness of Justice Beg. He fell ill in February & March 1973 and was hospitalized thrice. His recovery and Chief Justice Sikri’s 2 week Europe trip and superannuation also came in way. However, due to parallel efforts by bar and bench the 5 month long arguments did not go in vain. In total there were 6 writ petitions (Keshvananda Bharati, 2 erstwhile rulers and mining, sugar and coal companies) and 20 intervenors. 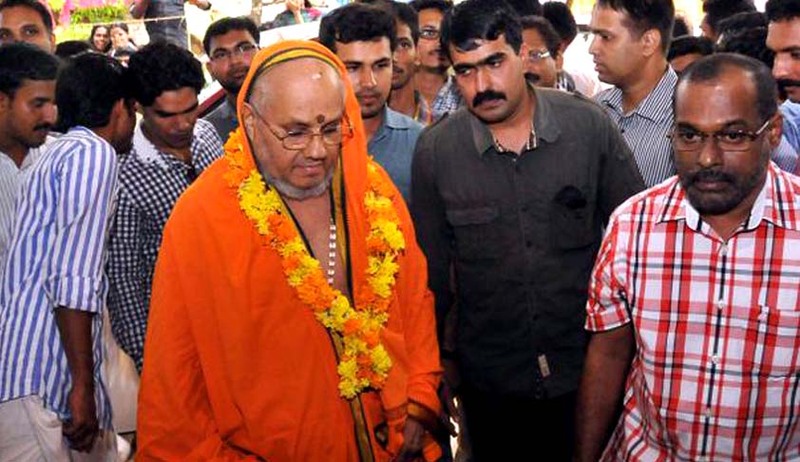 The full name of the religious leader from Kerala, Keshvananda Bharati is “His Holiness Kesavananda Bharati Sripadagalvaru”. Interestingly, he never met Palkhivala. 9 out of 13 judges overruled Golaknath Six judges, Justices Sikri, Shelat, Grover, Hegde, Reddy & Mukherjea held that fundamental rights were essential part of the Constitution and cannot be abrogated; Six others, Justices Ray, Palekar, Mathew, Beg, Dwivedi & Chandrachud held opposite. The 13th Judge, Justice Khanna in a shifting opinion, favoured the BSD in later part of his judgment. All 13 judges upheld the substitution of the word ‘amount’ for ‘compensation’. Six judges held that this amount will be subject to judicial scrutiny, six including Justice Khanna said the opposite. However, Justice Chandrachud here tilted it in favour of judiciary by permitting judicial scrutiny. 7 judges including very harsh attack by Justice Khanna held that the latter part of Article 31C was invalid. Apart from crafting of the BSD, Union of India succeeded on virtually all other points. The 24th & 29th Amendments were upheld and the 25th Amendment which sought to introduce Article 31C was partially struck down by 7:6. The judgment in fact helped the government in its socialist agenda. The deletion of ‘compensation’ was upheld and the ‘amount’ was not necessarily to be paid at market value except that it could not be illusory. Towards the end of the hearing, the Indira Gandhi government came to know of the inclinations of judges and that the Chief Justice and 3 senior most judges were going to limit unlimited power of Parliament was sought by her. This resulted in the first dramatic supersession of judges and Justice Ray who favoured government’s stand was made the Chief Justice of India overstepping the seniority convention and jumping over Shelat, Grover and Hegde JJ. The three judges immediately resigned. This however did not stop Indira Gandhi to repeat it again and Justice Khanna was overstepped to make Justice Beg as Chief Justice later on. Unsurprisingly, Justice Khanna had authored against her in Keshavananda Bharati and ADM Jabalpur unlike Justice Beg. In June 1975, Allahabad High Court found Indira Gandhi guilty of corrupt electoral practices. The arguments in her appeal before Supreme Court were completed on October 9, 1975 and on October 20, 1975 Chief Justice Ray passed a written order constituting a 13 judge bench to check whether or not the BSD restricted Parliament’s power to amend the Constitution. Interestingly, no review was filed against Keshavananda Bharati. On November 10, 1975 13 judges assembled in Court Room 1. Out of the earlier 13, only 5 had continued in office. Palkhivala requested the bench to clarify if any review petition was preferred. Justice Ray answered that the State of Tamil Nadu had. The then AG of Tamil Nadu who was present in the courtroom stood up and denied it immediately. Interesting arguments flowed next day too and Attorney general Niren De began his submissions by calling Palkhivala’s a ‘political lecture’. However, when on November 12, 1975 the case was posted as soon as the bench assembled, Justice Ray pronounced that the bench was dissolved even before few judges had occupied their seats and the attempt to overrule Keshvananda failed. BSD gave life to the spirit of the Constitution and at many instances saved democracy and rule of law in India. Advocates may come and go, Judges may come and go, judgments may come and go but the legend of Keshvananda Bharati lives on. Happy 43rd, Boss!